The maps depict the substantial changes that occurred at Happy Valley Shopping Center and surroundings between 1982 and 2012. Overall, the main building has become much larger at the expense of the grounds, while new facilities have been added both inside and out. In 1982, the shopping center was surrounded by trees. A lake was positioned to the east with a long driveway to the south connecting the entrance to a major road. Inside the building were a coffee shop and toilets on the east side, a food store and central entertainment area in the middle, and sports, electronics and furniture stores in the western portion. Elevators on the south side ran up to a movie theater on the second story. By 2012, the shopping center had expanded a great deal to the west and east at the expense of trees that used to grow there. On the western side, a new furniture retail section stood in place of the lake and coffee shop. Additionally, beneath that, a car park now stood where the drive way once passed. Although the entrance hadn’t moved, many of the stores inside have shifted. In place of the food store is a sports store and electronics store. Meanwhile, the eastern side had been extended to house new themed restaurants and a relocated food store. Other features remained the same. Describe the major extensions over time. Use locational phrases and prepositions to order your writing. Describe the original building so you can highlights changes in the next paragraph. Past perfect is used to describe the changes as occurring at some point in the past before 2012 (also before now). Don’t use past simple. 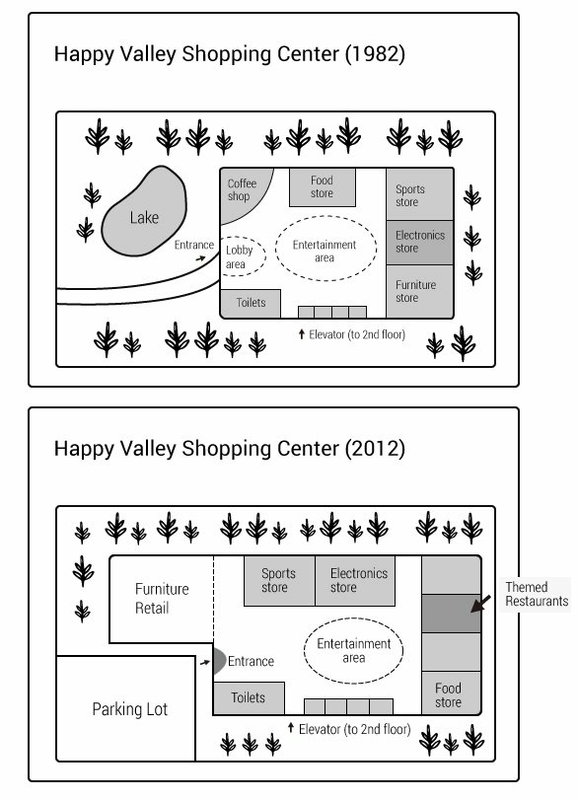 The maps depict the substantial change occurred at Happy Valley Shopping Center and surrounding between 1982 and 2012. Overall, the main building have become much larger at expense of the grounds while new facilities has been added both inside and out. In 1982, the shopping center was surrounded trees. A lake is positioned to east with a long driveway to the south connecting the entrance to major road. Inside building were a coffee shop and toilets on east side, food store and central entertainment area in middle, and sports, electronics and furniture store in the western portion. Elevator on the south side ran up to movie theater on second story. By 2012, shopping center has expanded a great deal to the west and east at the expense of trees that used to grow there. On the western side, a new furniture retail section stood in place of lake and coffee shop. Additionally, beneath that, car park now stood where the drive way once passed. Although the entrance hadn’t moved many of stores inside have shifted. In place of food store is sports store and electronics store. Meanwhile, the eastern side had been extended to house new themed restaurants and a relocated food store, other features remained the same.